I love using both white and black sesame seeds in my recipes. They add texture, aroma, flavor, and color. I use a lot of sesame when cooking, and preparing vegetables with a sesame dressing is very common in Japan. I always prepare the dressing in advance and keep some in the refrigerator ready for use. Sesame seeds should always be toasted before use, taking care not to burn them. It gives them an extra-special flavor and makes them easier to make into a paste. If you cannot find sesame seeds or paste, you can use peanut butter or tahini as a substitute. Please experiment with this dressing — try combining it with other ingredients such as rice vinegar, miso paste, or dashi stock to make new sauces and dressings. Prepare the green beans: Lightly cook the beans in a pan of boiling water with a little salt, then drain and rinse under cold running water and pat dry. Make the sesame dressing: Put the sesame seeds into a mortar, preferably a Japanese mortar with a grooved interior. Grind the seeds until they are almost a paste, then add the sugar, mirin, and soy sauce, and mix well. Add a little salt if needed. 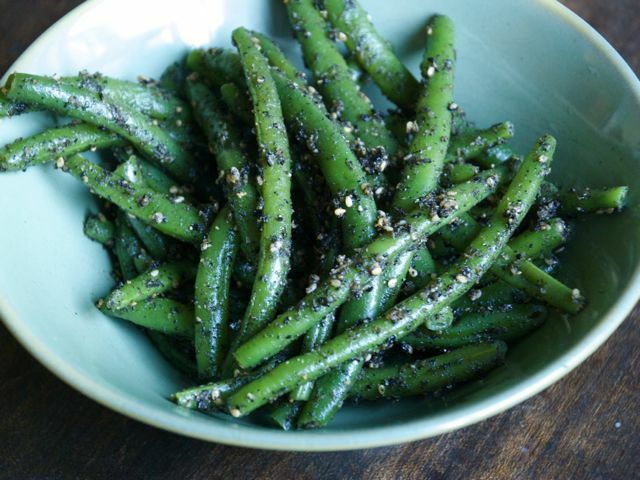 Mix the sesame dressing in with the green beans and serve. The paste can also be made in a food processor, but be careful not to overprocess. Culinate editor's note: Halving the sugar still results in a lightly sweetened dish.